The last two days made me realise the Dravidian inside me. 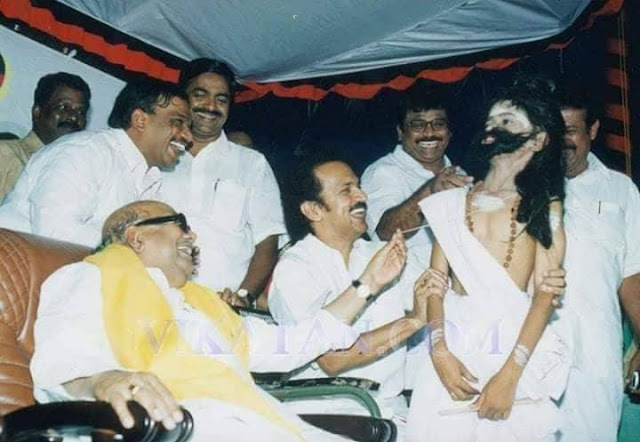 When I was scrolling across my news feed, I could see many people praising #Kalaignar. But among them were a few people who were spewing venom. Some of these venoms even included false information. 1) Naam Tamizhar friends of mine. 2) Brahmin friends of mine. It was the year 1990. I was 8 years old. I studied in Morton English Primary School. I was in class 3. I had a class mate. Her name was Lakshmi Priya. She always got the first rank in class tests. Whenever I could not attend classes, I would go to her house to get her class notes. Whenever I reached their house, I would be asked to remove my sandals outside the compound wall (not outside the house). Then I would be asked to come to the backyard. I will be made to stand near the grinding stone which was at the backdoor. Her mother would keep the note book on the thinnai. I will be allowed to keep my notebook on the thinnai and copy from her classnotes. I thought that they were a disciplined family and hence followed this. When I am done with copying from her classwork, her granny would come with a mug of water and pour it on the thinnai and wash it with a broomstick. I did not know why she was doing this. One day when I told my mother about this discipline in Lakshmipriya’s house, my mom with tearful eyes told me “From now on, you need not go to her house”. Cut to the year 1999. Till then I did not know such a thing called as caste. At home, they never explained to me about the caste system. Even while learning about the caste system in school text books, I studied it only as a subject and I never related it with me or my classmates. His name was Santhosh. He used to come to school with a big Tirusul mark on his forehead. I did not know that it was his caste symbol. I was short and hence was made to sit in the front bench. He was tall; but still chose to sit in the front bench. It was a practice for school teachers to ask questions to students. I was not the extremely studious guy. I would score in the 80s. Whenever I answered a question correctly, he would either slap me or pinch me and say “Dai parapayaley! Nee ellam padichu enna panna pora” (Hey “caste-name-boy! What are you gonna do by studying?”). I did not even know that the word “parapayan” referred to a caste. But I considered it as a cuss word because he would use it in an angry tone. When I shared it with my uncle, he told me that parayar was actually a caste name and brahmins considered them too low. My uncle also told me that I did not belong to that caste. There was this colleague of mine who wrote a mail to the HR stating that I was bringing beef to the cafeteria and it was causing disharmony among employees in the organisation. How I handled that issue is another story. Yes! he is a brahmin. We have different spiritual beliefs. We have different political beliefs. But we eat beef together and we talk about politics and religion freely. I have never seen him degrading people based on caste! For me he is a shudra; he is a kshatriya, he is a vaishnavite and above all, a human being. These are just three incidents I have mentioned that has happened in my life. And I love Kalaignar for putting all the caste fanatic Brahmins in their place. In this past 70 years, I believe, caste discrimination's got faded out to a considerable level. What is the data point to support your statement? Not at all.. In public places, for rental houses, socialising with friends is still a struggle, unless and until they hide their caste. Can you please explain this a little "My dear dalit comrade"? Person even hide their blogger identity and calling an unknown as dalit comrade. Wow. The first thing I felt was anger at these elders who did what they did to you. God knows when this discrimination and caste system will die in our India. It is an infection in the roots and if we leave it that way it will infect the whole society. People like your Brahman friend should be there in every family, who break this discrimination. In what way and how can someone decide they are superior than the rest. I hate this utterly. Disgusting. Ridiculous?!?! How does eating beef cause disharmony? Curious to know how you handled that bro! Made sure to bring beef more often. Formed a beef lovers gang at work place and introduced them to all the beef food joints in the city. Okay my dear Dalit friend! I hear you. But nee konjam moodikittu iru..
How true! The caste system can only be eradicated through intercaste marriages.Sadly, even believing Christians wouldn't agree to it.I just hope change starts with this generation. Not just Brahmins... my mother says her periamma (name not mentioned to protect the guilty) would wash the thinnai after the dhobhi came and went, they were also only allowed to use the back door. The person i mention is a household name in kk district. So perhaps it is a case of big fish eating little fish and little fish eating littler fish? You can send message to my inbox if you want the name.